To travelistas, long-haul flights and travel in general are not excuses to sacrifice style for comfort. You won’t see me in my jammies even on a 10-hour flight. (And word to the wise, never wear Spanx on a plane!) I’m forever trying to strike the balance between chic and comfy. While flip-flops are much better for walking around compared to stilettos, they are still absolute no-nos. Boots with socks are a suitable choice as they keep your toes warm and prevent your feet from attracting bacteria. Safety tip: Stuff cash into your socks while you travel! Speaking of accessories to avoid when traveling, add belts and jewelry to the list. Although jewelry can add pizzazz to a simple ensemble, rings, bracelets and such will be a hassle to remove during the security check, much like a belt. If you must have jewelry, keep it to a minimum and don’t wear anything expensive (I lost my favorite ring in Iceland!) Oprah writer Amber Kallor also suggests that you forgo anything considered edgy, saving spiky embellishments for times that don’t involve a metal detector. When deciding an outfit, it’s also vital to consider the stops you’ll make on the way to your destination. As a budget traveler, you’ll find that the most affordable itineraries often consist of long layovers, sometimes in the least ideal locations, though there are times we catch a break and land in a capital city or other destination with lots of sights to see. For example, a layover in Heathrow, the UK’s busiest airport according to parking price comparison website, Parking4Less, can connect you to London and other surrounding areas for a day trip. The parking aggregator also points out that even if you do opt to use the Heathrow Express, you’ll be in the center of London within 15 minutes, which probably isn’t enough to ruin your smart blouse. If you’re venturing out of the airport for the day, you’ll want to be prepared. England is notoriously known for the rain, and being drenched can really dampen the experience or make you sick (read my tips for staying healthy when you travel!). To make the most out of the weather, have an umbrella handy, or if you feel that it’s too bulky, a thin, foldable raincoat is your alternative. Better safe than sorry. I’ve worn this Steve Madden jacket all over the world. 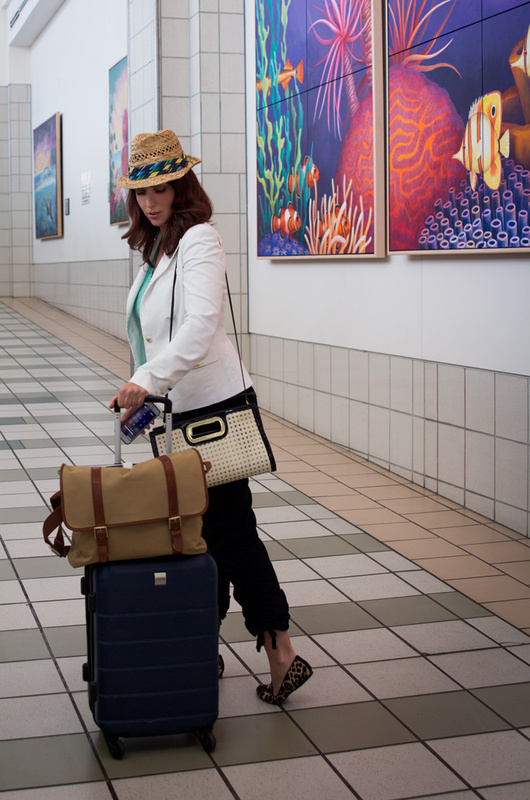 It ticks all my boxes in a travel piece: stylish, water-resistant, lightweight, and inexpensive. Your footwear is also key to protecting yourself from the elements. Other than wearing walkable boots, think about the material. Suede is obviously not the suitable option in the rain, though rubber boots are a pain to stomp around in. Opt for the water-resistant boot, and if you don’t own a pair or have waterproofing spray, Diply has an at-home tutorial that you can refer to. Keeping everything mentioned in mind, there are an endless number of ways that you can look chic while passing through airports. For some celebrity style inspiration, check out Who What Wear. What apparel and accessories are your travel staples? So in love with that Boden sweater… for any day of the week. I shared my Ideal Travel Outfit on my blog and it’s definitely so nice when you finally find that perfect outfit that’s versatile, comfortable and still put together for frequent travel. Great tips! While I would never be considered fashionable, I like to wear a comfy Patagonia dress (doesn’t wrinkle) with leggings and a scarf. The leggings and/or scarf can come off it’s hot. Good tips for travel outfits. I also stick to cotton and natural fiber shirts, they breathe better. To save space in my luggage, I usually wear my bulky shoes (boots or booties) for the flight. Some great items here. Comfortable shoes are a must for me. There is a need to be practical but at the same time stylish. Thanks for sharing. I think traveler’s develop a travel uniform after a while.. mine is a short sleeved shirt with my logo, sweater over it incase it is chilly and my favorite travel pants by REI… and boots or low hiking shoes… both with comfy socks!! Leaving the accessories at home is a great tip… too much to mess around with for security. I love this post. Now I want to go out and buy a whole new wardrobe. I travel often for work so it is important to look stylish, you never know who you will meet! Immensely helpful. Striking that balanace between chic and comfy is never easy. I will remember these tips next time I travel. Thankyou! !